This post contains some affiliate links (which means I may receive a commission if you click a link and purchase something that I have recommended) but is not sponsored by any of the learning platforms mentioned. The content in this post consists of purely my own thoughts and experiences whilst taking part in online learning. 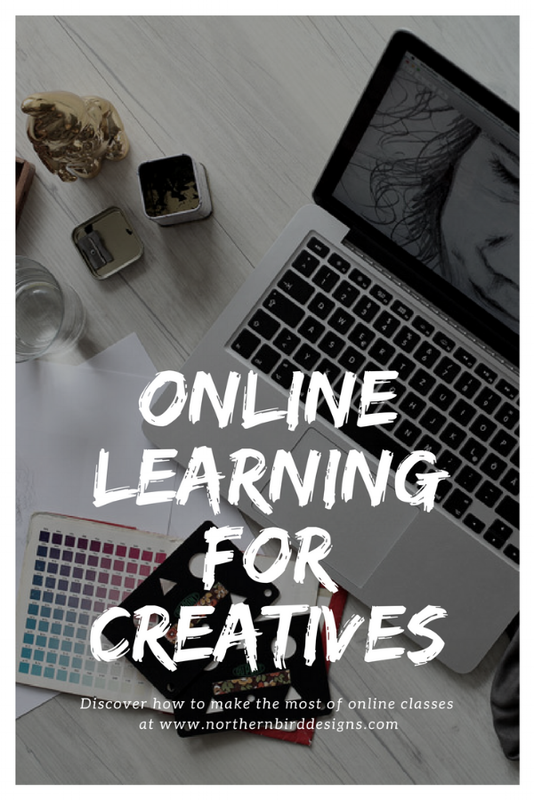 Whether you are exploring a creative lifestyle for fun as a hobby or pursuing the arts as a business, being able to access online learning platforms can greatly enhance your experience as well as boost your current knowledge and skill set. Once each blog post is live I will update the links in the timetable below so that you have a handy reference point to come back to. There are countless courses, both live classes and study at your own pace versions, creative video series and interactive study groups out there. They are run by fellow creatives who have many years experience in their fields or have honed their skills so finely that they wish to share their work processes with others. Online learning consists of one or multiple teachers offering their advice, knowledge and experience to students via content that is set up in a virtual classroom environment. Sometimes the platforms work on a subscription service, either monthly or yearly payment options, or you pay for a course in a stand-alone manner. Once you have enrolled you will have access to the class and course materials for a set duration or in some instances, have lifetime access for as long as the platform exists or the duration of your subscription payment. When venturing into online learning for the first time it's always a good idea to look into any free trials or free courses offered by the platforms so that you can get a feel for the style of teaching and classroom layout, and to see if it suits your way of learning. One of the best ways to get a feel for a specific class or course is to look up reviews. Considering that social proof will help inform your decision by seeing if the students who have previously took the course sound like your kind of people. Look up the courses relevant hashtags on social media and see if the work being produced from the class is the type of work you want in your creative portfolio. The best thing about online learning is not only do you get to learn from the comfort of your own home and in your own time, but you get to engage with fellow creatives from around the world. See it as an opportunity to find and become part of a tribe of like-minded souls, a chance to connect with others. Why should I explore online learning? Everyone has there own reasons for pursuing creativity. Mine came about as I found myself dealing with multiple chronic illnesses and rather than wasting my time binge watching Netflix I wanted to return to my art which I sorely missed. Stuck in the house with limited mobility and no one to talk to during the day other than the dog, signing up for creative courses online has provided me with a purpose to make art, an opportunity to make new friends from around the world and it's a welcome distraction from daily aches and pains. When you have a focus in life it feels like you can move mountains. If you would like to be reminded when my latest blog posts are live then be sure to sign up to my email newsletter. Have you signed up for any creative classes online? What are your recommendations? Let me know in the comments below!